We specialize in French bulldogs ,xl American bully and xxl American Pitbull terrier. We breed for amazing temperments and exotic colors like blue tri , lilac tri , purple tri , champagane , fawn and merle . Been in buisness over 13 years with a open door policy where you get to come meet us and the dogs. Jetta(mother) is a Blue and White Full breed American Bully. Jetta is a well mannered bully that is raised with 6 children. She is laid back but is a very fun family dog. She weigh 55 pounds. Biscuit(father) is blue brindle full breed American Bully. He is also raised with children and is a very incredible tempered dog. He is about the same height as Jetta but about 65 to 75 pounds.Tan puppies are already taken and so there are 3 girls and 2 boys left. Professional Breeder of the American Bully Breed. Our Kennel is committed to the code of ethics for breeders as set forth by the American Bully Kennel Club ABKC. We specialize in registered Standard and Classic size Tri-Color American Bullies from champion bloodlines. Located on the out skirts of San Antonio, Texas we offer health guarantee's, shipping thru out the US and finally a commitment of lifetime support to every bully that comes from our breeding program. 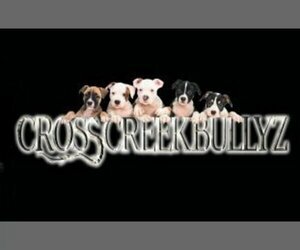 Looking for a reputable American Bully breeder in your area? Simply browse through our nationwide directory of 1000s reputable American Bully breeders - complete with website addresses, dog breed profiles, and current puppies for sale.